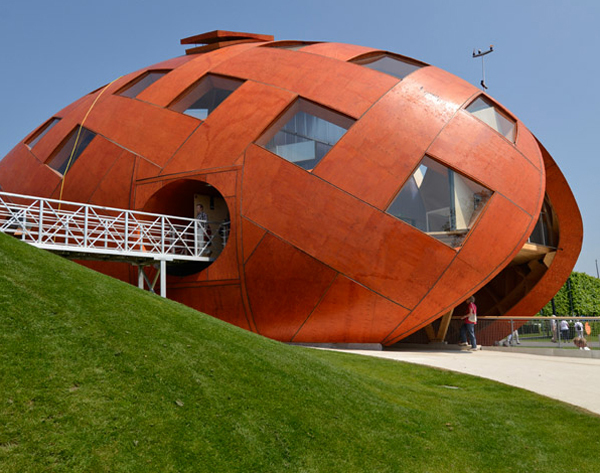 Orange stained Finnish hardwoods wrap an egg shaped pavilion dubbed “My Green World” designed by 2D3D. The project took only 6 months from concept to completion using roboticly precut wood members with a resulting woven exterior reminiscent of a seed. The building was commissioned by the Dutch Ministry of Economic Affairs, Agriculture and Innovation for the Floriade 2012 Expo in Venlo, the Netherlands. 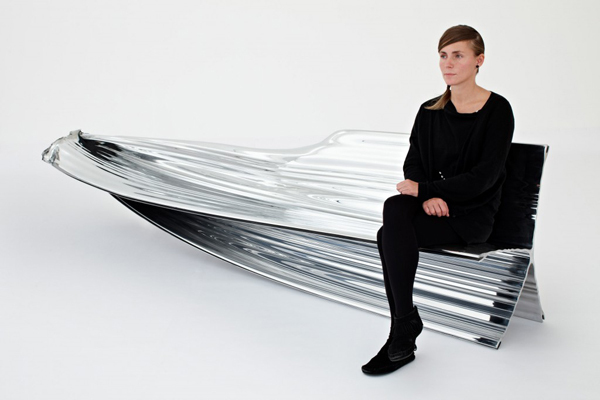 Created through collaboration between Sebastien Leoon Agneesens, New York-based French musician and artist, and Situ Fabrication, the sculpture was produced as an exhibition piece for B Brian Atwood’s New York showroom. Named after a medieval mythological poisonous snake, the Leontophone is a sound sculpture aiming to poetically hypnotize its audience through visual and sonic stimuli. 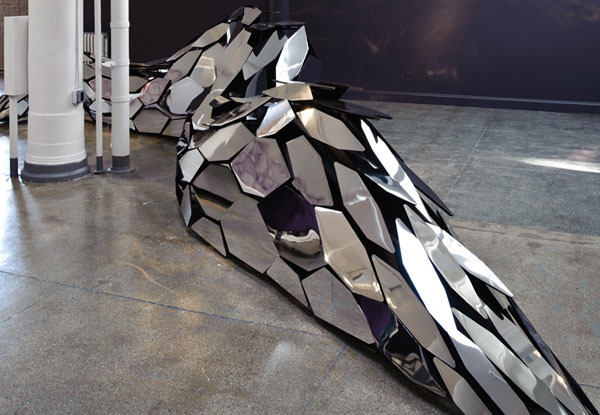 Born from the encounter of op art and glam rock, the 32-foot long piece is composed of 174 mirrored aluminum keys reflecting distorted images of reality. The Leontophone plays a looped original melody created on a vibraphone filtered with electric guitar pedals. Most people believe cardboard is the mundane material that is used to make boxes, after which, carelessly thrown away. 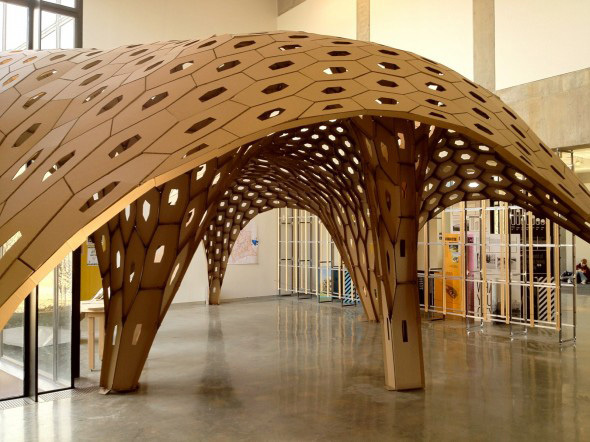 Yet, this thin shell structure, made by the professor and students at University of Minnesota, along with help of MATSYS, uses that exact material to produce a walkway installation for the school. The students completed the project within a 4-day workshop focusing on parametric/thin shell structures, student team design competition, fabrication, and assembly. 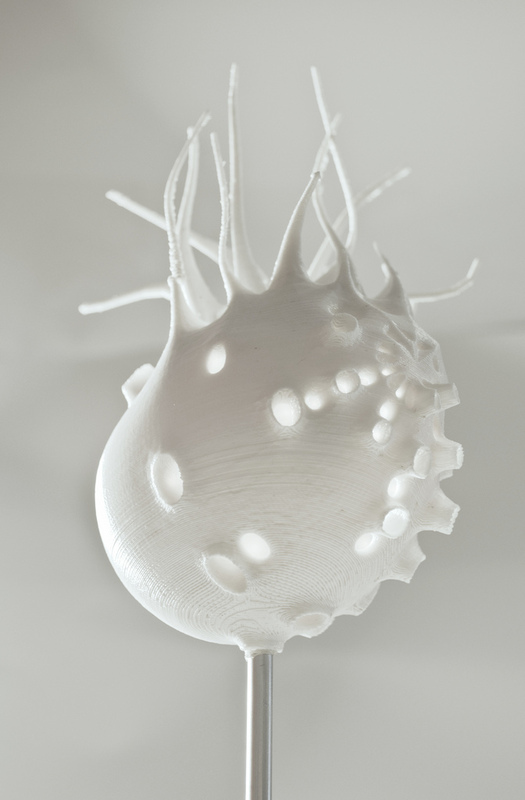 The hex shell deals with the design aspect of parametric process. Using tools provided by MATSYS, the students generated the form in response to the circulation of the area. To guide and reinforce circulation, dimensions of the structure coincide with traffic flow and usage density. The site-specific installation for the roof of the Metropolitan Museum of Art in New York is part of a larger body of work, experimenting in space, social relations and collectivity. 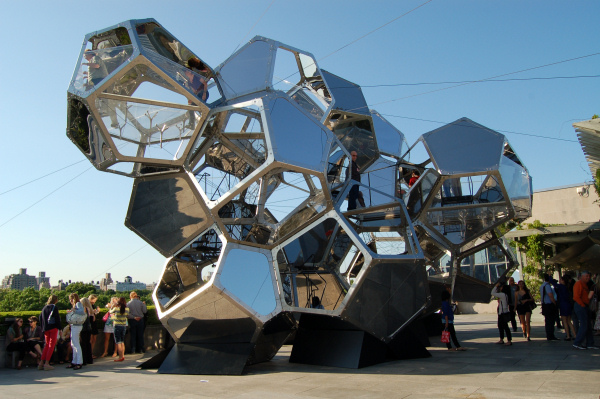 The geodesic dome has been built from sixteen interconnected modules in the Museum’s Iris and B. Gerald Cantor roof garden, measuring fifty-four feet long, twenty-nine feet wide and twenty-eight feet high structure. 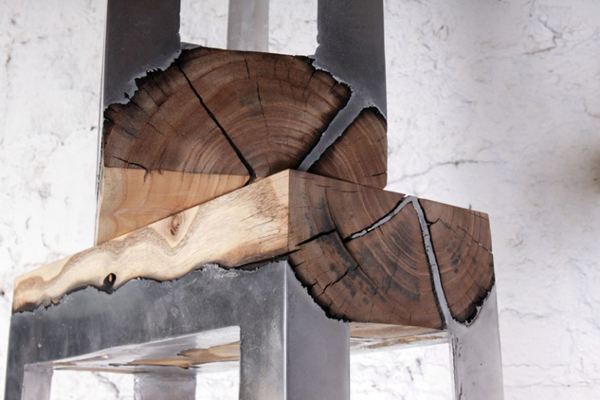 The angular and bubbled form of the piece is comprised of glass segments cut in non-identical geometric shapes held in place by steel joints, reinforcements and steel cables. 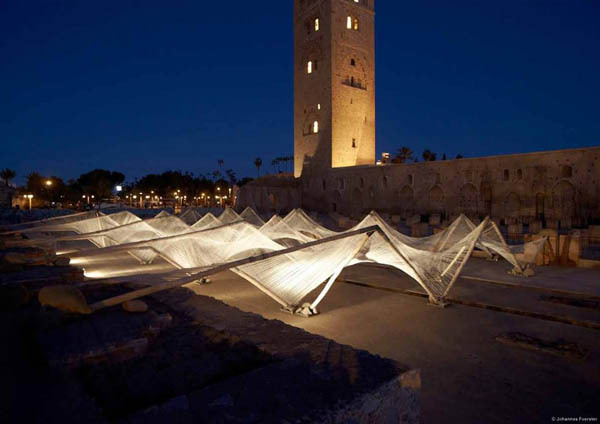 Attempting to assume a fresh approach to digital fabrication, the project combines indigenous, traditional craft techniques of Marrakech with current algorithm software programming. Traditional Moroccan weaving techniques are used to render physical the forms designed in programs such as Rhino and Grasshopper. 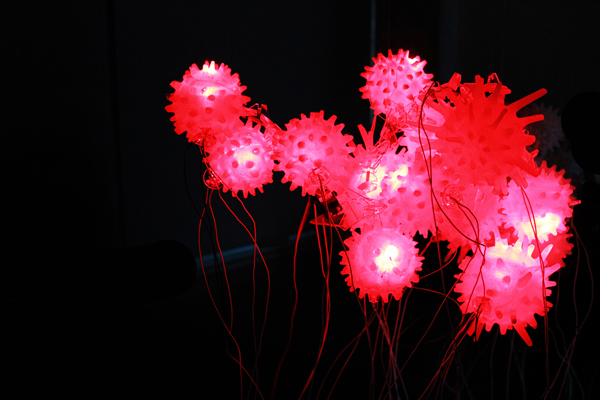 The process is, as the architects state, a nonlinear one, going back and forth between the physical and the digital. 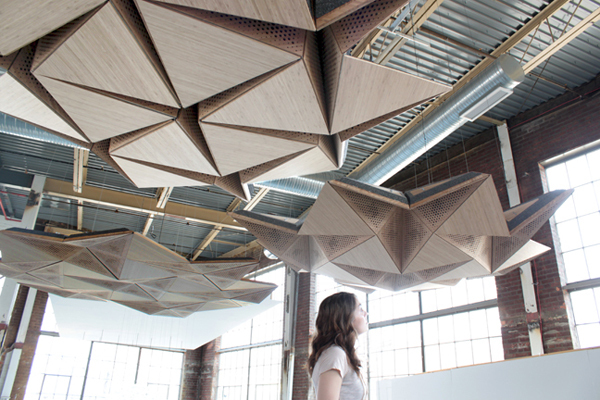 Turning the performance hall into a dynamic environment for various types of musical events, the Resonant Chamber installation explores the acoustic possibilities of a space. It investigates ways in which it can be customized and adapted to suit almost any type of performance.